Claim your FREE 16 day access to this transformation project. Including over £65 worth of downloads to help you get started. I know you are probably going to want to see what you are getting yourself into before you commit to this, this is why I'm going to show you exactly what you get when you become part of #team1661. Below are all 6 guides you will be getting when you sign up to the project that will help you achieve an incredible transformation and fat loss results. As soon as you sign up to the project you get a huge amount of content and value for FREE. One of which is the 'Kick Start Training Manual'. 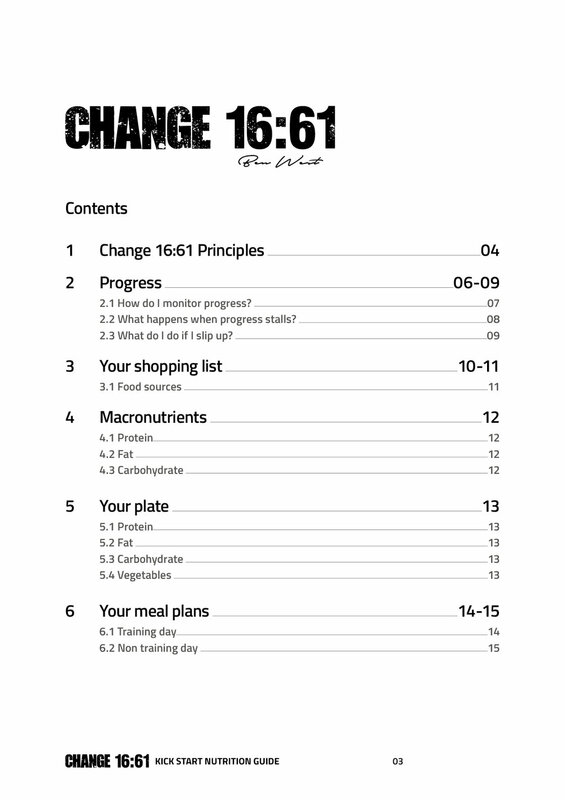 This document is designed to kick start your training and get you prepped and ready for the full 61 day coaching. Here we will be focusing on finding your level and ability for training in order to provide you with a training plan that you can follow for the full 8 week body transformation project. Videos, warm ups, cool downs, mobility drills and a plan thats designed to help you burn fat are all included in this manual. This is just the beginning of your nutrition journey to a healthier, fitter, leaner you. So when you open up your 'Kick Start Nutrition Manual' I guarantee you will be blown away by the detail and material sitting in front of you. Like the training manual, this is designed to get you ready for a whole 8 weeks worth of nutrition, fat loss and results. Portion control, shopping list, hydration, eating on the go and managing your meals are all looked at in great depth throughout the FREE 16 days. What can I say, I love to cook healthy food that not only takes minutes but tastes out of this world. With this book you are going to get each and every recipe, method and calorie breakdown so you can do it yourself. Dieting doesn't have to be boring nor does it have to be tasteless. Learn how to burn fat and build lean muscle whilst still enjoying a delicious plate of food. A nutrition plan tailored to your calorie targets. This plan is perfect for those wanting to follow a strict regime with food or those who simply want ideas of how a days worth of food should look. Try some of these delicious meals without the restrictions, being able to follow a fat loss plan that doesnt feel like a diet is whats going to help you win at getting the results you deserve. This is the very best online nutrition guide designed to get you healthier, fitter and leaner. Having had 6 years worth of trial and error, successes and failures, I have been able to create and deliver the very best method for fat loss that is sustainable. This 14,000 word journey is designed to take you from where you are now to where you want to be. Learn everything you need to know about creating a sustainable approach to fat loss that gets results and allows you to enjoy the process. I guarantee this alone is worth the investment. The very first online program that is designed specifically for your goals and ability. The one plan fits all approach has had its day, its now time to have a plan that is designed specifically for your ability. Being able to progress as well as regress your training is key to improving and committing to the whole process. 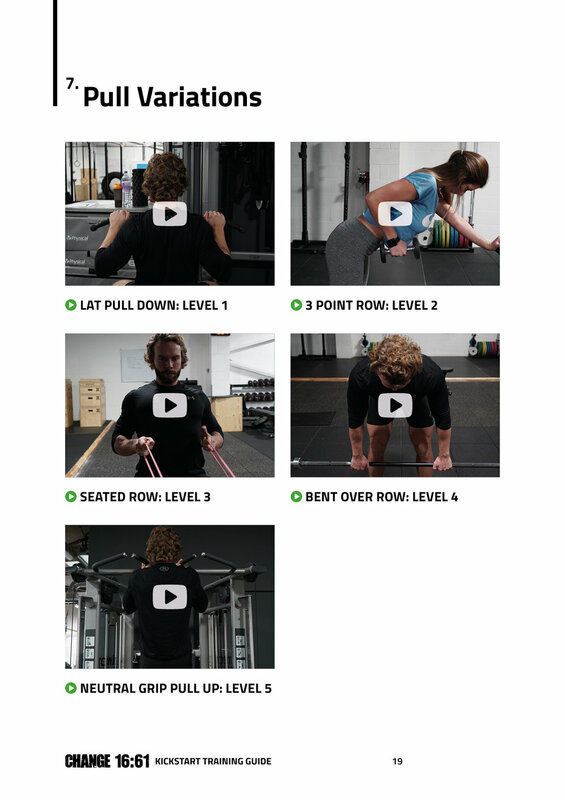 With over 100 exercises all being demonstrated by Ben and his clients, learn how to train optimally and safely in order to get the results you deserve. 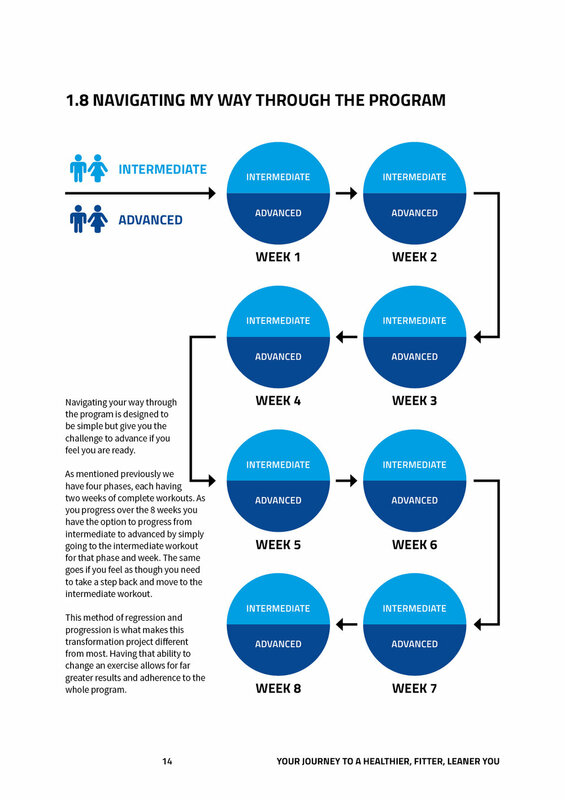 This 8 week program will leave you proud and happy with what you have achieved. Follow the link below and get started on your fat loss journey today. 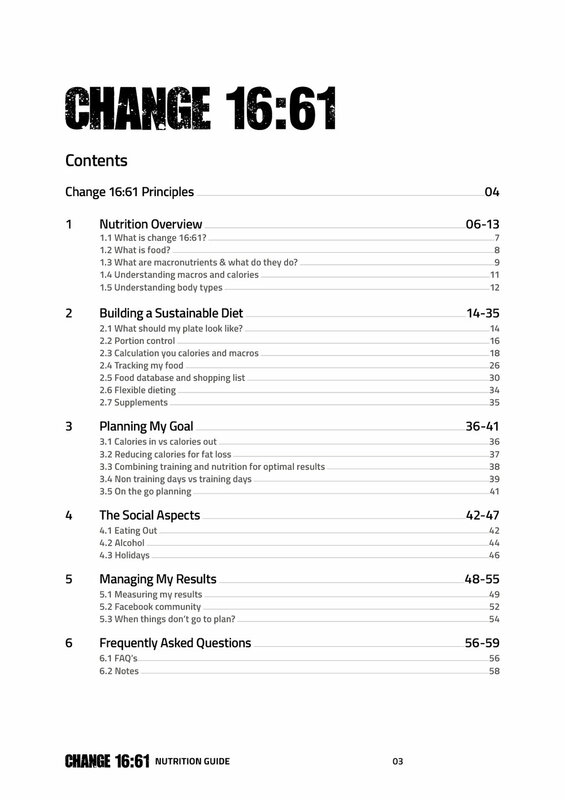 Sign up now to receive your sneak peek to the #Change1661 exercise & nutrition manual for absolutely FREE ! !